The liberal media piled on Rep. Louie Gohmert (R-TX) this weekend for his comments on welfare fraud. 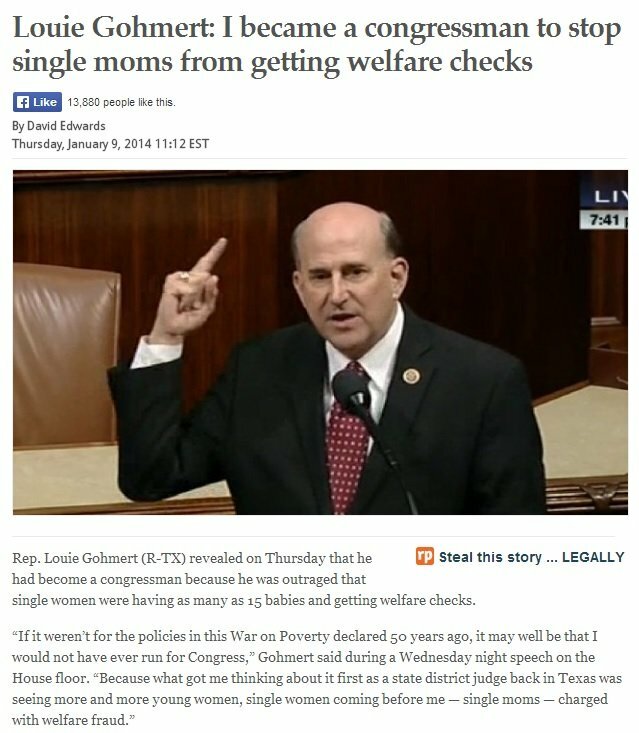 What Gohmert actually said was that he got into politics to fight “welfare fraud” not welfare queens. But, of course, the Democrats fear government accountability and personal responsibility. So they attack any conservative who speaks out against government waste, fraud and failed liberal policy. And so the situation only gets worse – thanks to Democrats. In 1963, one year before Johnson’s absurd declaration of “war” against a universal part of the human condition, the white illegitimacy rate in the United States was 3.07 percent, according to the Department of Labor. The black illegitimacy rate was 23.6 percent, according to the U.S. Department of Labor. Fifty years into the war, the illegitimacy rate – THE SINGLE MOST CONSISTENT PREDICTOR OF POVERTY – is 25 percent for whites, 42 percent for Hispanics and a truly staggering 72 percent for blacks. Good for Rep. Louie Gohmert for making a stand.